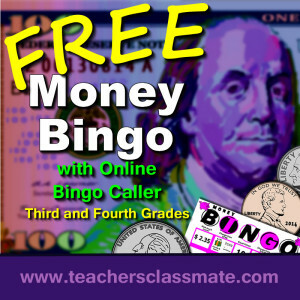 Designed for third and fourth grade math centers, Money Bingo features an online bingo caller that will work on most personal computers with internet access. It can also be played on an an interactive whiteboard. Use the online bingo caller to draw random question cards and to display called answers while students play along with their own printed bingo cards. This download features 4 player cards that can be printed either in black and white or in color. I prefer to print in black and white, as the students need to make calculations and write on their bingo cards. -Adding / subtracting to determine difference between the amount of money available and the listed price (i.e. The listed price is $3.50. You have 90 cents. How much more money do you need? Be sure to visit my website and try the bingo caller. Click on the photo in this post to download a set of 4 player cards.